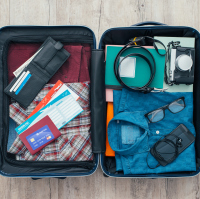 Some 86% of UK adults took an overnight trip at home or abroad in the 12 months to August, research by travel organisation Abta shows. This is up from 77% in 2015 and represents the highest figure since 2011, when 90% of adults booked at least one break. The average number of holidays taken per person per year is also seeing a rise over the past year, from 3.2 to 3.4. A number of events are affecting the travel industry, such as terror attacks in Paris, Nice and Brussels, an attempted coup in Turkey, the collapse of Low Cost Holidays, the spread of the Zika virus and the weakening of the pound following the EU referendum. However, despite these events Abta's director of brand and business development, Victoria Bacon, describes the sixth annual Holiday Habits report as "remarkably positive". Over half the population (56%) took a holiday abroad in the last year, compared with 54% in 2015. Young families with at least one child under five are taking the most UK holidays, with over a quarter (26%) going on more than four domestic trips. This is being fuelled by millennials and baby boomers, with people aged 25-34 and 55-64 the most likely to take more than four foreign holidays in a year. The trend is set to continue as the study finds 73% of people plan to spend about the same or more on their holidays in the next 12 months. Ms Bacon said: "The story of the previous 12 months, for holiday-taking at least, is remarkably positive. It's been a bumper year for domestic and a good one for foreign holidays. "Brits love their holidays and they won't give them up easily. "Our research suggests a continued positive outlook towards holiday-taking next year, although I would add a note of caution given the uncertainties that still lie ahead for the UK economy around the Government's Brexit negotiations." No matter the destination they are travelling to, British citizens are advised to take out travel insurance.